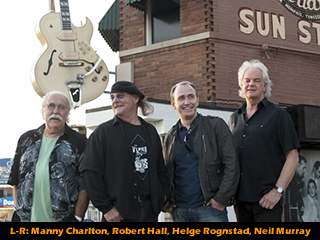 Ex-Nazareth guitarist Manny Charlton says: “I grew up listening to the early Sun records from the 1950’s, so it was great to record some tunes at the birthplace of rock n roll. It took me right back to my youth. I remember when I first discovered Elvis all those years ago, I looked at his picture and wondering how he got such a great sound coming out of his acoustic guitar! It was only later that I learned about his guitarist Scotty Moore, and subsequently decided to become a guitarist myself." It will be the second time that Whitesnake bassist Neil Murray will play with Fluffy Jackets, having already appeared on their self-titled EP in 2007. Apart from playing with the band at Sun Studio, Neil also joined for further recording sessions at the Cowshed Studio in London, UK. 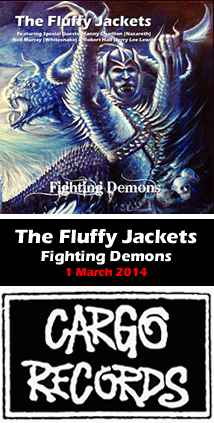 Neil Murray comments, “It has been interesting to follow the progress of The Fluffy Jackets first hand. It is also enjoyable to play on the new original material, getting the opportunity to stamp my own personality on the songs from the outset. I think that my melodic bass lines have become a nice little feature in this release”. “With musicians based in UK, USA and Norway, the main challenge was to bring people into the same room at the same time,” says Fluffy Jackets' front man Helge Rognstad. “It certainly would have been both cheaper and less hassle to email music files back and forth. However, I feel that making music is all about playing instruments together so we all made an effort to meet up in person. The upshot is that the making of this album has been so much more enjoyable and emotional. It has been an incredible journey for me and I hope everyone else have got something out of it too”. The Fluffy Jackets’ debut incorporates elements from different styles of music. 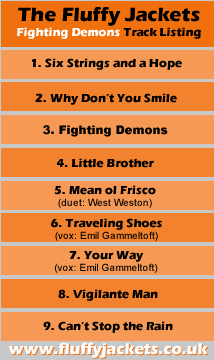 Though rooted in blues/rock, the album also includes acoustic singer/songwriter songs, and even folk music. The instrumentation includes both electric and acoustic guitars. The renowned guitarist Manny Charlton appears on several tracks, playing Dobro, slide, electric and acoustic guitars, there is bass from the legendary Whitesnake bassist Neil Murray, drums and percussion by Jerry Lee Lewis’ drummer Robert Hall, and even harmonica from one of Europe’s hottest harmonica players West Weston. Other musicians who appear on the record include Emil Gammeltoft from the Swedish folk-rock band Some Kind of Rubus, plus Fluffy Jackets’ bassist Jerry Bessent and drummer Nick Rhodes. Please click HERE to view a selection of high resolution images, suitable for print-purposes.